If you're lucky, both you and your console could dress up in Gears of War duds. 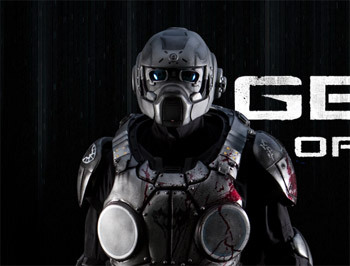 One lucky Gears of War fan will win a full set of COG armor, as worn by Marcus, Dom and the rest of Delta Squad, courtesy of console accessory manufacturer Calibur11. All fans need to do to enter is purchase Calibur11's official Gears 3 "vault," and then enter their special code on the Calibur11 website. According to Calibur11, the armor is "life-sized" and made of "full industrial resin composite." It includes the breastplate, helmet and armored pieces, with the winner having to supply their own weapons, boots and underclothes. The armor has also been signed by the Calibur11 team, which sweetens the deal even more, if you're a Calibur11 fan as well as a Gears of War fan. For 100 runners up, there are "Bleed Out" hoodies to be won, a design based on the game, and exclusive to Calibur11. You have to really be into Gears 3 to enter though, as the "Vault" - a Gears of War-themed case for the Xbox 360 Slim - is a penny short of ninety bucks. Then again, it seems rather fitting that a one-of-a-kind Gears of War collectible ends up in the hands of a genuine fan of the series. Click here to get more details about the competition, including all the terms and conditions. It's worth taking the time to do it too, as there are quite a few limitations on who can enter.